When it’s time to replace the Epson EB945 projector lamp you’ll notice the power indicator is flashing blue, and the lamp indicator is flashing orange. You may also notice the picture has gone dimmer or the color is off. An on screen message will also appear; “Time to replace the lamp. ” You can expect 4900 hours of use when the projector is set to Normal and about 5900 hours when the ECO mode has been started. 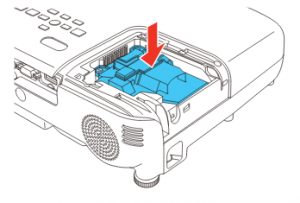 The Epson EB945 projector uses model Epson ELPLP78. The best thing you can do to keep your prjector working properly is to buy an authentic Epson EX7220 projector lamp. Most counterfeit lamps cost more in the long run because they have a shorter life than original lamps. While counterfeits claim to be compatible they are often created with toxic materials including including Krypton-85. Lamps that are not OEM are prone to explosions and usually can damage the projector’s sensitive optics. Your eyesight is also at risk. Buy an OEM authentic Epson EB945 projector lamp and keep your projector working properly. Turn off the Epson EB945 projector and unplug the AC cord. 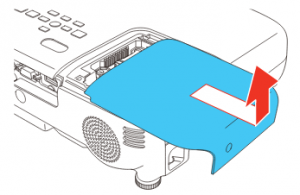 Allow the projector to cool for one hour – it should be cool to the touch. 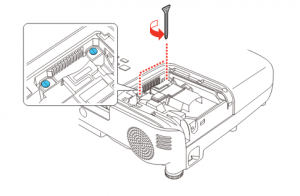 Inside of the projector can be very hot since these machines operator under high temperatures and you run the risk of being burned if the projector has not cooled down. Loosen the screw holding the Epson EX7220 lamp cover in place. Loosen the two screws holding the Epson ELPLP78 in place. 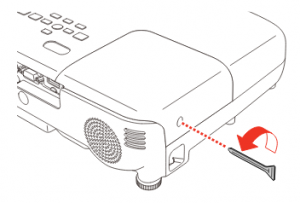 Grab the raised section of the lamp and gently pull the lamp out of the projector. NOTE: The Epson ELPLP78 lamp contains mercury and should not be thrown into regular garbage. Recycle your used lamp. Take the new Epson ELPLP78 projector lamp by the handle and gently put it into place making sure the lamp is facing in the right direction. Don’t force the lamp into the projector. 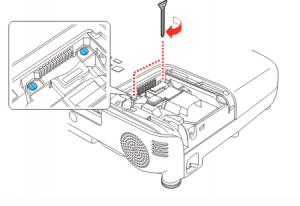 Replace the projector lamps screws. Re-connect the lamp cover. Re-attach the power cord. Turn the projector on and let it warm up. You are ready to reset the lamp timer. Reset the Epson EX7220 Lamp Replacement Counter only when the Epson ELPLP78 lamp has been replaced. Press MENU to display the RESET menu. 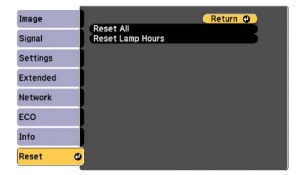 A prompt will display asking you if you want to RESET LAMP HOURS. The lamp hours will be reset to zero. The lamp timer will be a zero. Turn off the Epson PowerLite 93 and let it stand for at least one hour ever 24 hours. An average use of four to five hours per day will ensure longer lamp life.